As a regular reader to my blog, you know that I'm very much into party and especially Christmas. I love every aspect of Christmas and spend a considerable amount of time working on perfecting my Christmas photo cards. The card itself is a reflection of myself and family so it has to be just right. Being an Army family, we move often and are usually apart from our family. The Christmas card provides a unique opportunity to provide good cheer as well as an annual pictorial of the children. I usually shop at Shutterfly annually to purchase at least one personalize present such as a wall calender or other type of gifts. 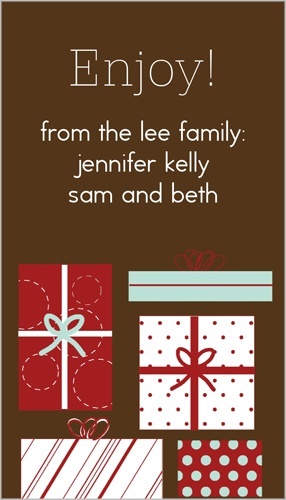 My favorite holiday card design are the photo cards that allow for multiple photos, are timeless and elegant. The design above, Family Wall Red Christmas card holds six photos. I really like the traditional red background and the elegant text on the front adds to the old charm appeal. Of course color photos could be used but I really like the look of the black and white photos for that timeless look. Having three children and a new grandchild at home affords me the opportunity to capture so many priceless looks that one photo won't suffice. Since I've purchased cards from Shutterfly in the past, I know they are printed on quality cardstock paper and the images are beautiful. I also like the feature that they will mail them for me if I choose for additional fees. This card is easy to create and takes no time other than picking the photos you want to include. One thing I also do to complete my perfect Christmas card and to add some bling is to affix a rhinestone (diamond color) sticker where it would look the best. For me, I love the added touch. I'll also utilize the backside to have my girls write their names to have that extra personalization step to it. As you shop for your Shutterfly cards, also check out the potential gift ideas from photo books, framed prints, stationery, calendars, puzzles, mugs, gift tags (above), storybooks, ornaments, aprons, home decor and so much more! If you are a shutterbug like me, you will love all the possible ways that you can turn a photo into something even more meaningful and lasting while making your Christmas shopping easier! Disclosure: I am participating in a Shutterfly blogger program to receive free product in exchange for this post. The opinions noted were not influenced by this opportunity however.